When I say "Soft & Chewy" cookies, just like I did for my pumpkin spice cookies, I really mean it! However, I didn't nail this recipe on the first try. A few weeks ago I made them and they were so rubbery you could bounce them off the hard wood floor (haha!). The second time I made them, I mastered just the right amount of fat to oat flour ratio and I think you'll agree, they have just right amount of softness and chewiness!! 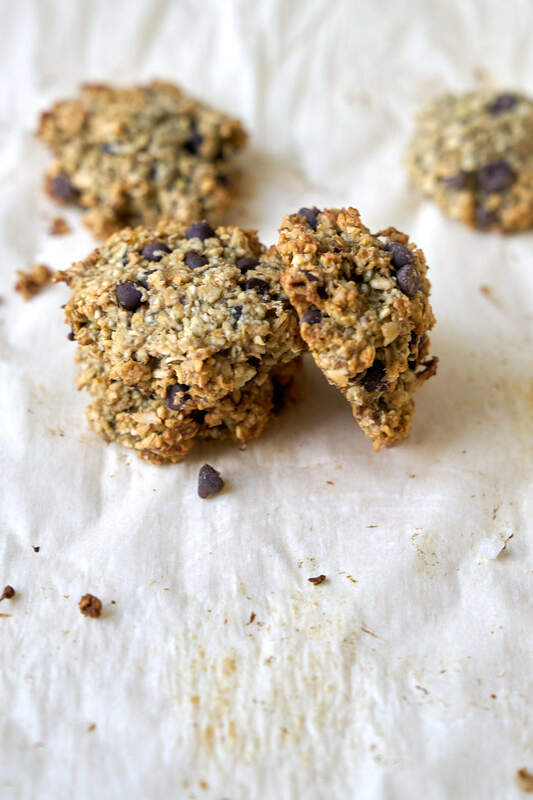 My goal was to create an egg and dairy-free, soft and chewy cookie which is no easy feat if you really want that perfect chocolate chip cookie texture. The reason I wanted to create an egg-free recipe is because the number of people who write to me or comment on social media asking me for recipes without eggs. Since we are a family who eats eggs many of my recipes include eggs, especially baked goods. 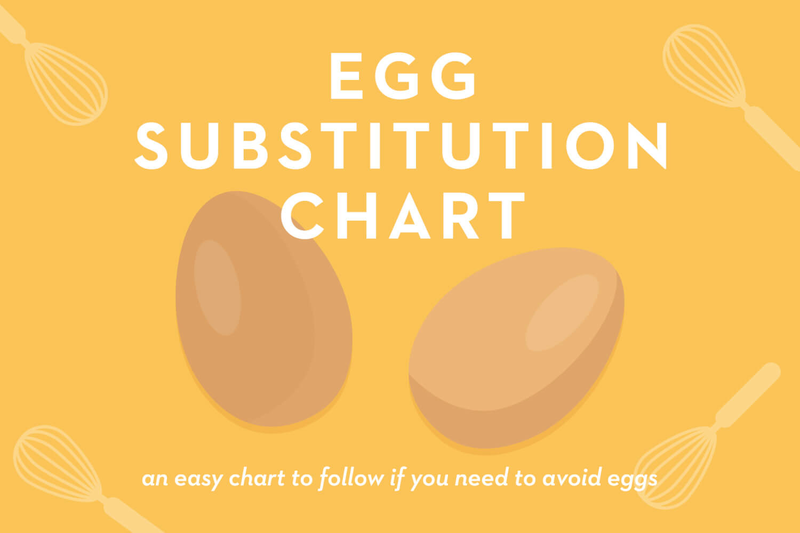 However, if you ever want to sub out the eggs for an egg-free alternative, my Egg-Free Substitution Chart would be super helpful for you! ***When you get the recipe below, please see my notes about the recipe in my video vs the recipe details below. 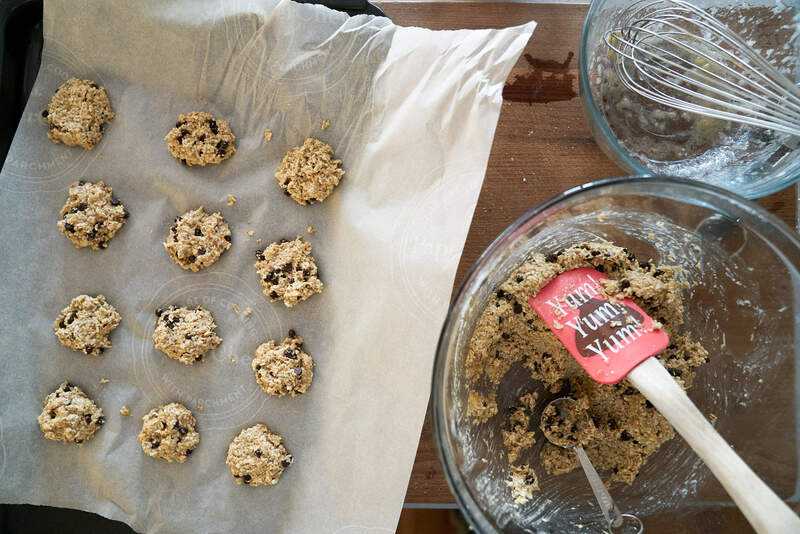 Now this recipe isn't earth shattering or rocket science, aside from the fact that there are NO EGGS and NO DAIRY which can come as a challenge when it comes to making cookies. But in fact, you probably have all the ingredients for these cookies in your kitchen right now! I think you'll appreciate how easy this recipe is; so easy, a toddler can help you make them! Vienna's happy place is definitely helping me in the kitchen. 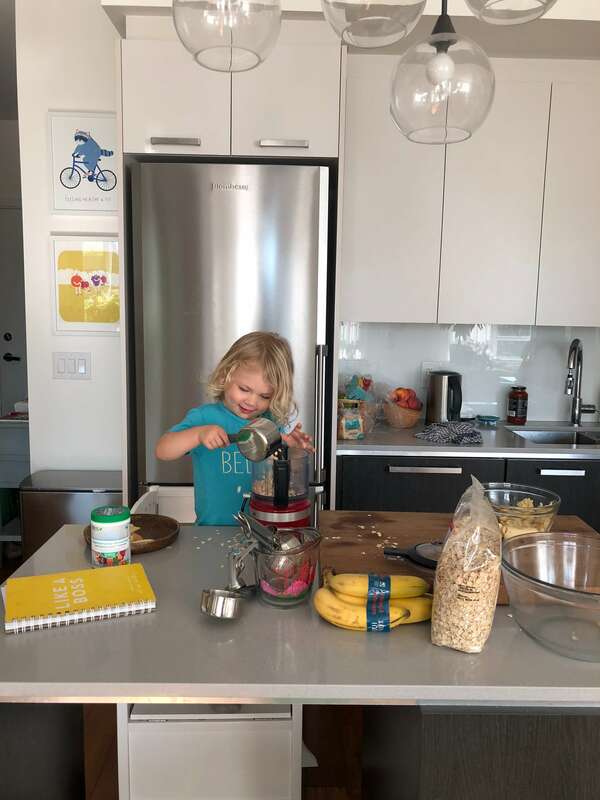 I took the photo below on my phone of her making the oat flour. 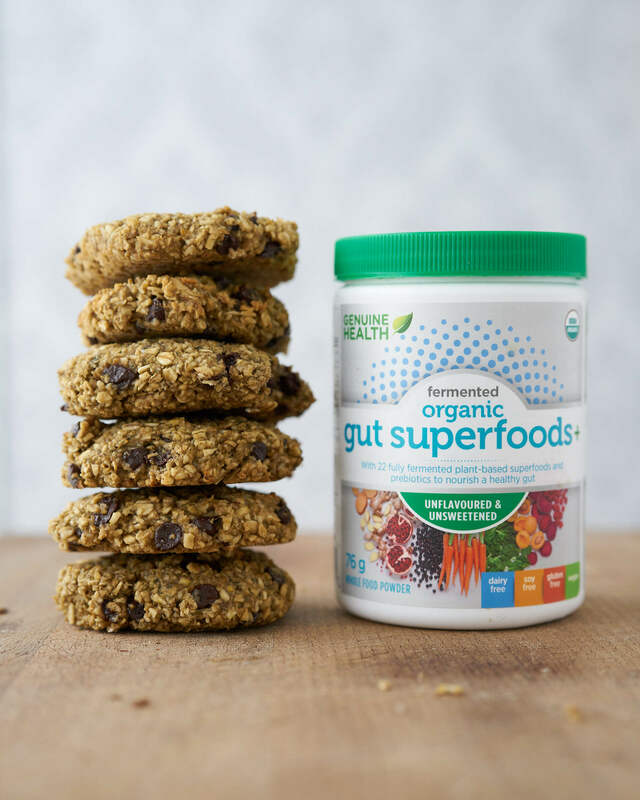 The gut-loving addition to these cookies that I think you'll appreciate, however, may not be in your kitchen right now and that's Genuine Health's Fermented Organic Gut Superfoods. I added a couple of scoops to the batter because I'm always looking for ways to boost Vienna's diet with solid nutrition. She's a pretty good eater, but every day is different and there are some days I'm thinking "oh my gosh, she's barely eaten anything!". She definitely doesn't turn down a cookie though, that's for sure. When I made these, she ate four. I made them smaller so she could have more than one. But I didn't mind, because we'd already had our dinner – Curry Cauliflower Quinoa Stew (it's delicious!). There are 22 fermented superfoods and prebiotics to nourish the gut and for whole body health. Prebiotics are incredible for gut health becaue they encourage the growth of gut bacteria which improves digestion, aid in the manufacturing of vitamins and enhances mineral absorption. Gut superfoods is very rich in polyphenols which encourage the growth of beneficial microbes. Microbes on the other hand, increase the absorption of polyphenols -- it's a win win! 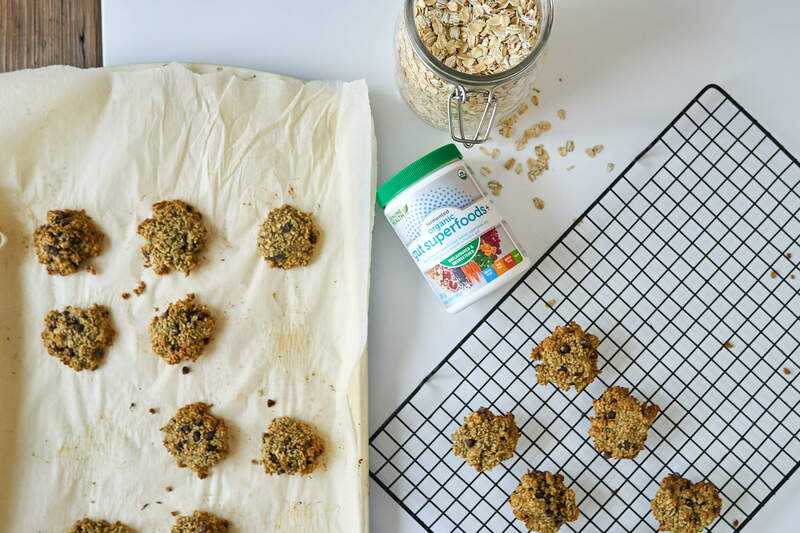 Just like my cookie recipe, Genuine Health's Gut Superfoods is also vegan! 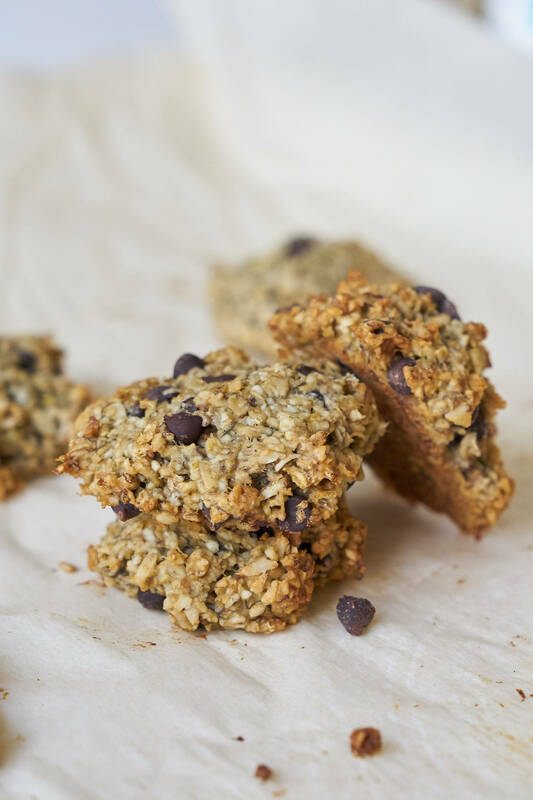 Plus, you've got the added benefit of these cookies being a wonderful source of fiber from the oats and good fat from the coconut oil. I know you're going to ask me this in the comments section so I will get ahead of it and save you some time. Yes, you can make these without the Gut Superfoods and they will still work, but I highly recommend it. 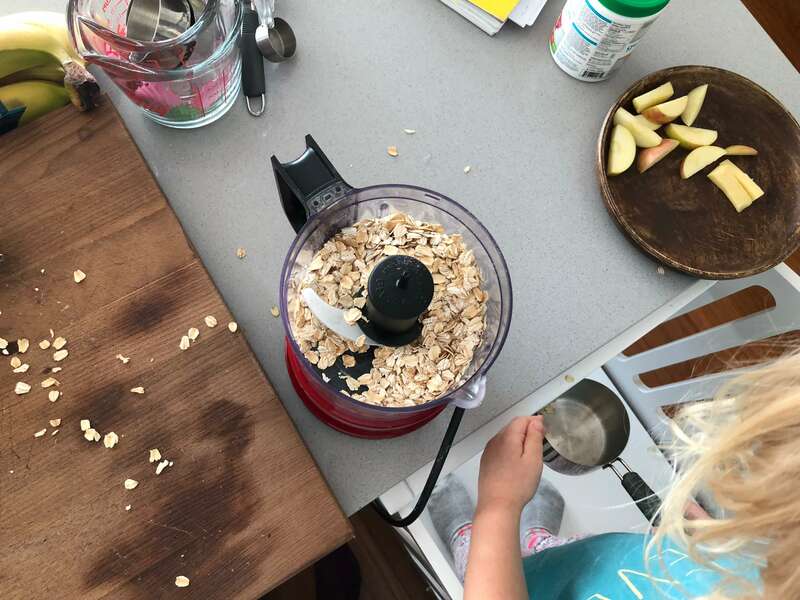 In a food processor blitz oats until ground up. They don't have to be finely ground. It's okay if you see some bits, but the more ground the better. 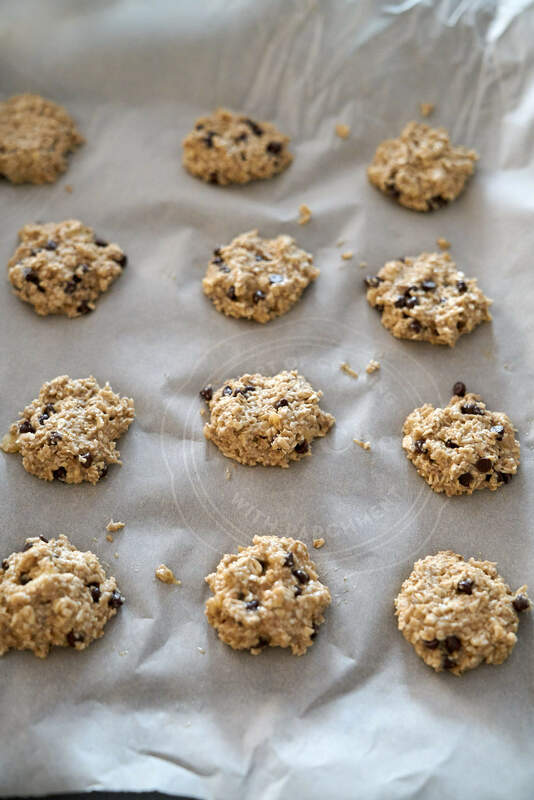 In a large bowl, combine oat flour, baking powder, baking soda, Genuine Health Gut Superfoods. Keep in fridge for up to one week or freeze for up to 3 months. If you are using really ripe bananas, you may not need to add the maple syrup. However, if you omit it, you'll need to add some moisture to the batter, so add either rice milk or nut milk in place of the maple syrup. If the batter seems dry, add another half a banana or add a touch more maple syrup. You'll see that this recipes requires making oat flour from oats, but you can most certainly buy oat flour already ground. The only caution is that I don't grind the flour to a fine texture like how you'd find the packaged stuff so that consistency of the cookies may change. ***As you may have noticed in my video, I added 1/4 cup of cranberries and I didn't use the Gut Superfoods product. 9 times out of 10 I use the superfoods product, but since it's not available to you guys outside of North America, I omitted it for the recipe. So if you're using store-bought oat flour, you may need to adjust the ratio of liquid (coconut oil + maple syrup) and flour. If you are an experienced baker, I have no doubt you'll be able to figure it out, but just wanted to mention that in case you don't make your own and they aren't as chewy as mine. They also freeze well and you can refrigerate them for up to 10 days. But if your home is like mine, they won't last that long! I have also made these into bars which I shared on my instagram. Basically you just flatten them out on to a cookie sheet. The batter doesn't fill up the entire cookie sheet, but that's okay! I added 1/4 cup chopped walnuts too. Any questions? Please post below! ps. I haven't tried them with oat bran , but they would probably work just fine. Did you bake these in the oven? At what degree and for how long? I don’t eat eggs so I really appreciate your recipe! Yes! I've added the information about baking them. Sorry for the confusion! Do you bake these at all? Yes you do, sorry for the confusion. I've added the information! Excited to try these! This may seem like a silly question, but how much oat flour is created from 3 cups of oats? I have some oat flour already made that I’d like to use up! It's not a silly question at all. It's pretty close to 3 cups so if you use 3 cups of oat flour, it should be fine. See my note about that though, in case the cookies are too dry. So you don’t need to bake these? There’s no step for baking. Just want to check! Thanks! How long should they bake for and at what temperature? I updated the info, sorry for the confusion! I’m assuming we bake them at 350F for 8-10 or are these no bake? So sorry for the confusion, I've added this information! I was a little tired today writing up the recipe forgot that MAJOR detail LOL! 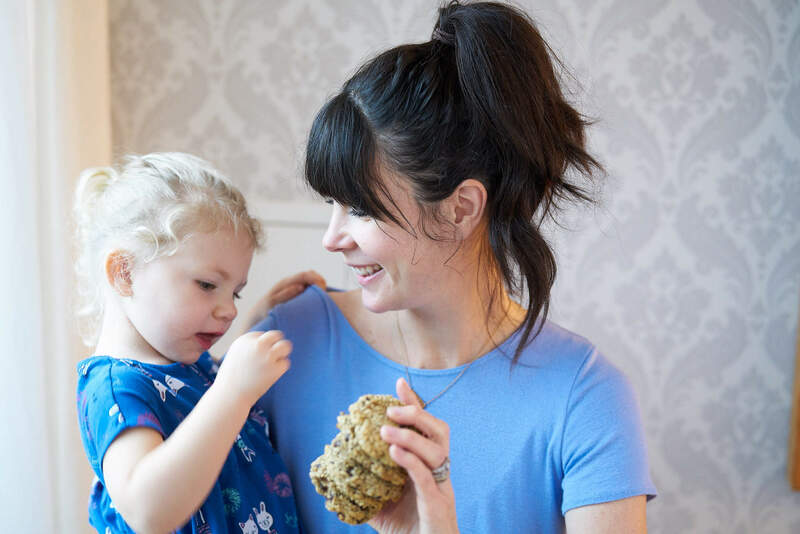 Do you know if cacao nibs are safe for toddlers? They are safe, but in moderate amounts. The stimulating properties of chocolate will be more powerful in raw nibs as opposed to chocolate chips. In this recipe, I used the Enjoy Life brand of mini chocolate chips. How are these stored best? :) Just made them - DELICIOUS! I refrigerate them, they will keep for over a week or in the freezer for any amount of time really if you can avoid freezer burn. Enjoy! Do you think I could add protein powder and still have them turn out? Yes definitely :) They may be a slightly less chewy consistency but will still be delish I'm sure! Would the probotic benefits be destroyed by the heat of cooking? No, you won't destroy the probiotic benefits. Hope that helps! Hi Joy - Thanks for sharing an egg and dairy free recipe! Would almond flour work in place of the oats? Hi Alex! Tough to say. The texture is quite different. If you can eat eggs, I would suggest using 1 egg when you swap it to almond flour. Hope that helps! Hi Joy Can i take the Gut Superfoods in my cookies or heck in anything if i am already taking a pill probiotic? Yes definitely. Gut Superfoods is different than probiotics. Gut superfoods is a prebiotic that helps to FEED the good bacteria. Hope that helps! In these cookies, do you use flavoured or unflavoured gut superfood? Yes, great question. Unflavoured and unsweetened. I will add that to the recipe! However, you could use flavoured too. How would these turn out without baking soda or baking powder? Probably just a little more dense but they will still work! We made these today after seeing your live feed when you were baking with your daughter. My little guy was quite thrilled watching her and was even more eager this morning when we were baking. "Like Enna, mama!" So cute! You're right, this is a great recipe to make with the little ones. OMG that is SO CUTE!! "like enna, mama". Sweetness x infinity. Thanks for letting me know, that made me smile! Glad you found a recipe you could make together. Hi there! This looks great! But are the superiors still active/effective after being exposed to heat (to bake)? Thanks! I assume you mean Genuine Health Superfoods product? Yes, there is no live bacteria in the product so it's safe for heating. I made these last night! So delicious. :) How do you store yours? I found that last time I made cookies like this they are so moist that they grew mold when I left the container on the counter. Maybe I just need to eat them faster! Glad you love them Jennifer! I put them in the fridge right away because I like the texture when they are cold. Enjoy! I don't have much a sweet tooth but I really enjoy these cookies and so does my family!! Made a batch last night. Glad to hear it Keeley! These are such a great pre and post-workout snack! 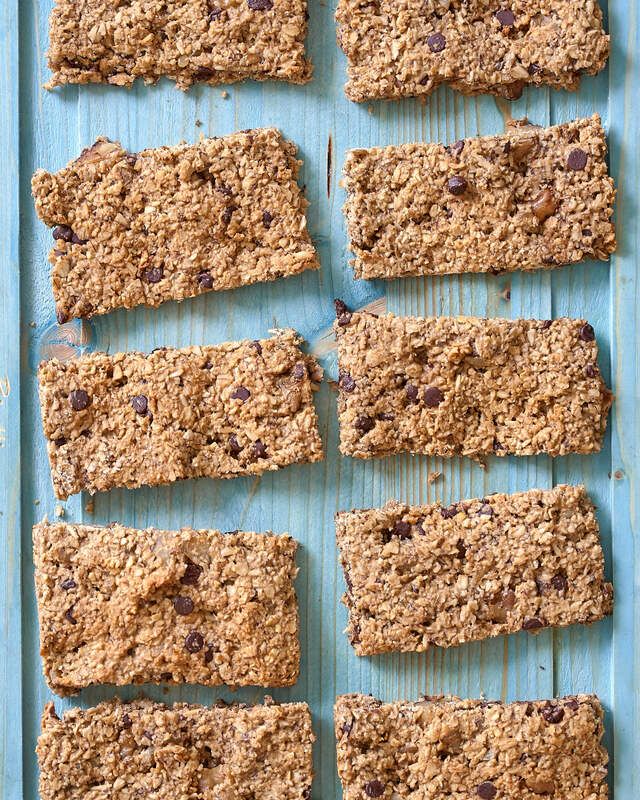 I baked this recipe in a square pan about 1-2 inches thick and cut them into bars! Any maple syrup brand sugestion? thant i can find in california. Good question, I would suggest going to your local Whole Foods or health food store to find a great brand. Just make sure it's 100% pure maple syrup with no other sugars added to it. Enjoy! Just made these and they are delicious! I was shocked at how perfectly sweet they were. This will definitely be a repeat! I know, so yummy! Glad you love them Corie! I think that would work but I don't know that it's quite as sticky as bananas. If you're not allergic to eggs, I would put in 1-2 eggs with the pumpkin puree and they will definitely stay together. Good luck! You're welcome Michelle, glad you love them!